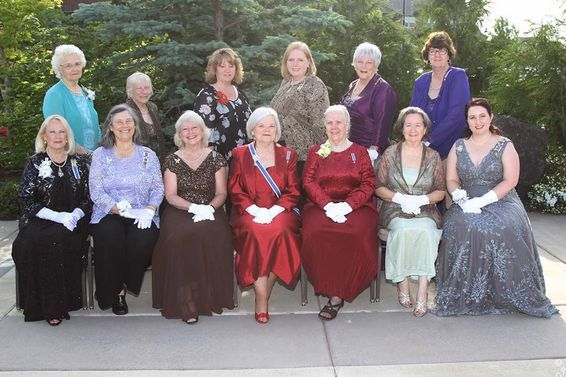 Pictured left to right on top row: Sue Glen, Parliamentarian; Mary Parrott, Custodian; Kristin Lowe-Bartell, Registrar; Martha Burrell, Treasurer; B. Diane Wheatley, Curator of Museums; Barbara Johnson, Librarian. Pictured left to right on bottom row: Sandy Fuller, Organizing Secretary; Rhonda Stone, Recording Secretary; Nancy Slagle, 2nd Vice State Regent; Rebecca Taylor, State Regent; Donna Dial, 1st Vice State Regent; Ruth Takahashi, Chaplain; Corey Martin, Corresponding Secretary. Not pictured: Pamela Olson, Historian. Keep up to date on our Facebook page.